The Water Sensitive City is the label given to cities where the policies and practices associated with delivering water system services enable liveability, sustainability, productivity and resilience. It encompasses all the aspects of the water cycle and other key elements of city planning and operation. 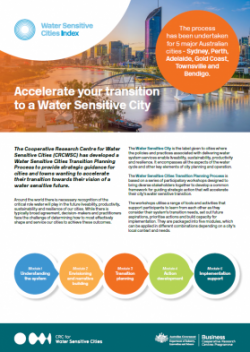 The Water Sensitive Cities Transition Planning Process is based on a series of participatory workshops designed to bring diverse stakeholders together to develop a common framework for guiding strategic action that will accelerate their city’s water sensitive transition. The workshops utilise a range of tools and activities that support participants to learn from each other as they consider their system’s transition needs, set out future aspirations, prioritise actions and build capacity for implementation. They are packaged into five modules, which can be applied in different combinations depending on a city’s local context and needs.